Just go for it! Your content marketing engine needs premium fuel and your social media platforms have the necessary octane boosters. However, simply creating accounts on every social media platform and posting content is not the way to gain traction and stimulate your audience. The challenge is to leverage your social media channels in ways that drive your content marketing efforts. 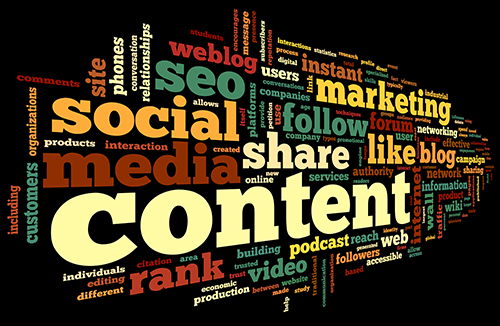 Here are some tips on how to boost your content marketing with social media. First things first. Before you use the fuel you need to build the engine. You need to produce and keep producing valuable and industry related content that speaks to the needs of you target audience. Conduct market research to identify topics and issues that appeal to your followers and align your content marketing around them. Write blogs, produce white papers, build case studies and share them on your social media platforms to draw attention and bring more traffic to your website. You can also gate your content and ask visitors to give you their information in order to view it. Another way to boost your content marketing with social media is by sharing quality content that was not originally generated by your team. Creating new content on a daily basis requires a great amount of time and resources that many companies do not have. However, keeping your target audience interested in what you do must be an ongoing process. In order to provide engaging content that aligns with your content marketing efforts, research and locate industry related articles and distribute them on your social media. Ask your internal teams to like them and re-share them on their personal accounts for greater exposure. Consistency is more than critical when it comes to social media marketing. Posting randomly, sharing outdated information and distributing unrelated content are going to have the opposite results than what you want to accomplish. If you really want to boost your content marketing with social media, you need to create an editorial calendar of what you are going to post and when. Which day and time of the week are you going to distribute your blog? What time of the day are you going to share your repurposed articles? In other words, put together a plan of action and hold your team accountable for living up to it. Social media gives you the opportunity to increase the reach of your brand message to more people. To achieve this, you need to speak to your audience in the language they prefer to use on social media. For example, the tone you use on LinkedIn could be different than the one you use on Twitter or Facebook. That being said, you need to adjust your style depending on the platform you use. Similarly, you need to keep in mind that each social network you use has different guidelines that you need to follow so make sure you configure your messages accordingly. The purpose of your content marketing strategy is to promote your services and convince your audience to work with you. Using multiple channels of social media allows you to draw the attention of more people. Your content might receive positive or negative feedback and you need to be prepared to take action. Monitor your accounts and make sure to respond to comments, address concerns and answer questions in a timely manner. Remember that the faster you get involved the more credibility you win. Do your best to win the trust of your followers as a firm that believes in building trust relationships.